Substance abuse treatment facilities must find creative and innovative ways to impact, engage, and save lives. However, it can be difficult for counselors to know how best to reach potential clients. With video counseling software, you can refine your practice with community counseling solutions from the admissions process to post-recovery care. Moreover, video counseling for substance abuse allows the client an opportunity to fit in the time to work on their problems by removing barriers to treatment that can become overwhelming. It’s time to prepare for the future. Brick and mortar treatment facilities still serve a role in common daily practice but do not let that define your operation. Researchers have questioned whether the infrastructure of many substance abuse facilities can offer adequate care to large people in need. Specifically, some researchers have pointed to problems in the admissions process, such as poor staff engagement with clients. However, video counseling software can allow your practice to engage with a potential client to establish an immediate connection. In addition, video counseling for substance abuse centers can not only provide higher admission rates but also a competitive advantage. The effects of addiction are not just limited to the addict. Usually, the families of people struggling with addiction take a direct hit too. This is why family therapy has emerged as such an important component of addiction treatment. Studies show that family-involved treatment approaches have higher rates of success and increased aftercare participation. Therefore, community counseling solutions that employ video chat technology can augment this treatment process for even better results. Video counseling for substance abuse centers can increase family participation with remote video family counseling. This could be especially advantageous for family members or spouses who have busy schedules and cannot make it to on-site visits. Recovering from addiction doesn’t end when the treatment period is over. Recovery is a lifelong journey and post-treatment period should be considered a type of continued care. Relapse rates are a serious problem for many centers. For example, two-thirds of individuals in recovery will relapse within a couple of weeks to months. 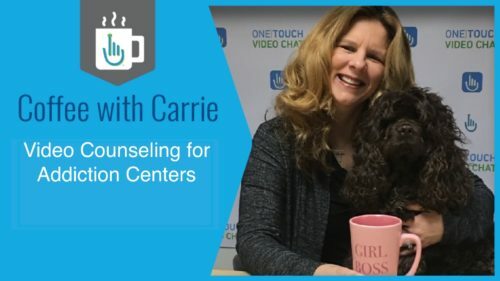 Video counseling software can help clients stay connected and accountable during this critical time. In addition, clients can connect with sponsors who have actual lived-experience and know what the individual is going through. Click here to see video counseling in action against the opioid epidemic.